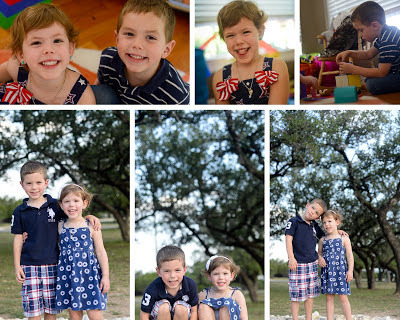 This July 4th weekend was filled with a couple of firsts for the Taylor kids. Every year since Jackson was born we've spent New Years and July 4th in Leakey with Leslie, Ross' sister, and Philip. Every year there has been a burn ban because there hasn't been enough rain. This July 4th weekend was different though! 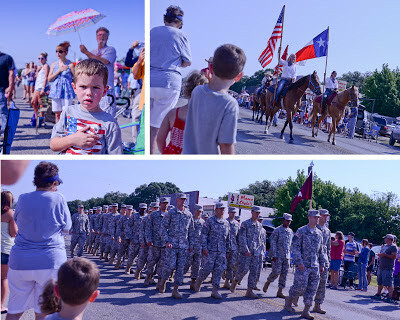 The area has had enough rain that we were able to do fireworks and float the Frio river! We arrived the afternoon of the 4th, and I managed to capture a few pictures of Jackson and Audrey before the celebrations began. 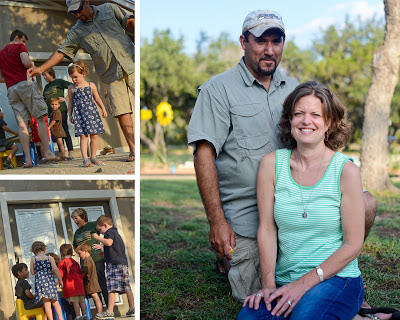 The top pics below were taken at our house the day before, and the bottom pics were in Leslie and Philip's front yard. 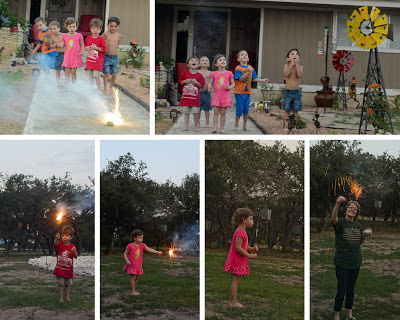 Leslie and Philip provided some poppers to play with on the driveway, and Grandmother provided some cupcakes to celebrate America's birthday. 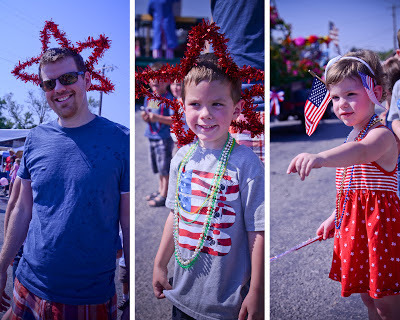 The kids had fun pulling the strings and watching the streamers fly, and they especially loved throwing the little poppers on the ground or stepping on them. In the end, they were covered in icing and sawdust, so it was a perfect time to send them to the pool! All of the kiddos had fun splashing around in the pool throughout the weekend. 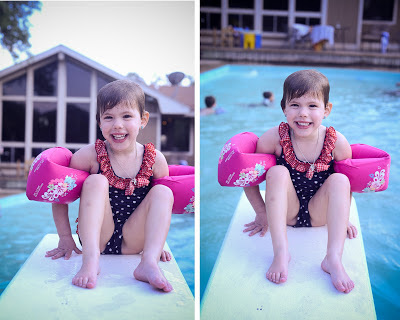 They dove for rings, practiced holding their breath and swimming, and took turns jumping off the diving board! As if that weren't enough fun for one day, fireworks were next on the agenda! Neither of our kids has ever seen fireworks, so this was an exciting moment for them! I loved watching their reactions. We started with some little ones, which got them over any potential fears. Then we moved on to some that went into the air, which amazed them. Then we let the ones who were brave enough play with sparklers, and as it began to get darker, the bigger and higher fireworks came out. Of course, the big kids (a.k.a. the Dads) enjoyed lighting these just as much as the little ones were in awe watching them. I also have to admit our kids were awed by the stars out there. Living in Houston and going to bed pretty early, our kiddos haven't seen very many stars. It was a perfect way to spend the 4th of July! Friday morning we made our way down the road to float the river. The kids helped pick out their tubes, and we caught a shuttle to the drop off point. The water was cool, but it felt great on a hot summer day. They had fun hoping in and out of the tubes to swim and float down the river. It was relaxing and fun most of the trip. It ended up being a little longer of a float than originally planned, which left everyone a little tired and hungry by the end, but Jackson and Audrey did great despite ending well past lunch time and ultimately at the tail end of nap time! 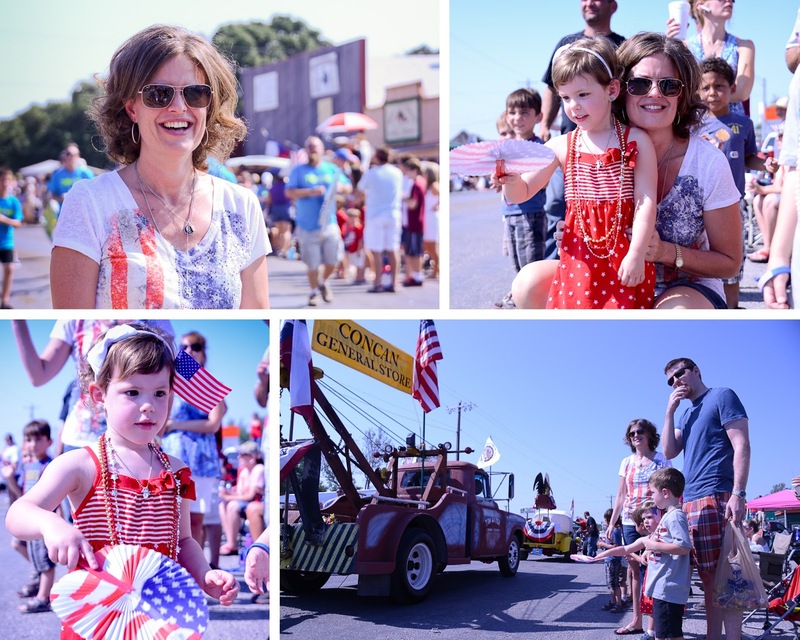 Saturday morning was the Leakey July Jubilee Parade. 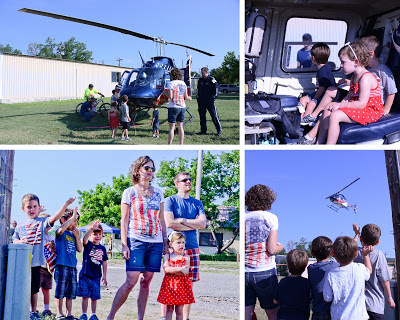 We arrived just in time to check out the local helicopter that provides life flight services and watch it take off. We then settled into our spots and waited for the parade to start. 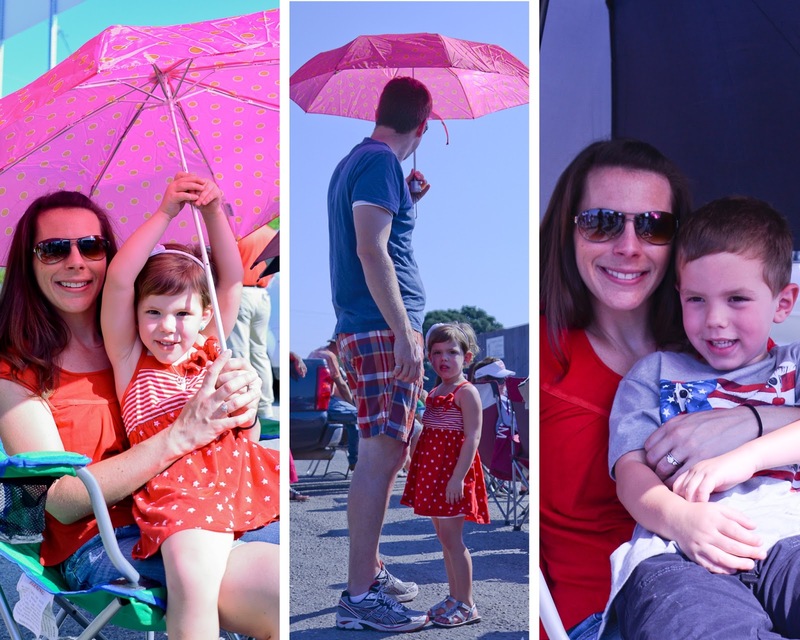 We were all grateful to have found some umbrellas in our cars to provide a little shade while we waited and had snacks. The parade started with the Star Spangled Banner, the waving of our flags, and a tribute to the soldiers who protect our freedom! Then there were cars and floats throwing beads and candy and toys! This also included a special appearance from Tow-Mater! Everyone got a little more patriotic...and silly as the parade went on! After the parade we found a local spot for lunch. Then Philip and Grandmother took the kids home for a nap while the rest of us did a little shopping at the Jubilee festivities. We brought home funnel cakes to reward them for their good deed. While Audrey and Mitchell took naps, Jackson got to spend a little 1-on-1 time with Grandmother at her house. They rode the Polaris and went to visit Granddad. When they got back, we were back in the pool! Jackson quickly joined the fun, and they splashed until they were exhausted. After dinner, Uncle Philip had a special treat. 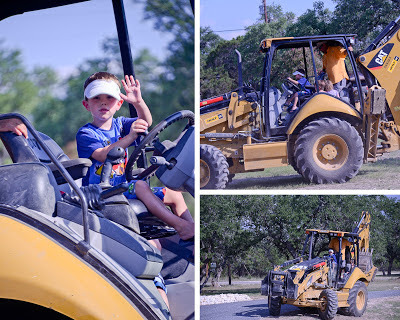 He let all the kids go for a ride on the backhoe, and Jackson got to drive! It was a great July 4th Weekend! There are a few more pictures in the album.